I’ve decided that my next tutorial series will be really big and will answer many of the questions I receive. The only problem is that most people either want to see an Android / Games Tutorial, or a J2EE / Application Development Framework Tutorial? I can’t do both because they will each take at least 6 months each, so I leave it to you to decide which tutorial series I will do first. Vote for your favorite tutorial below and which ever one gets the most votes wins. The tutorial that won, won by over 411 votes! So, for the nest year, I will cover the following topics. May of which I have already started. While one or the other of the above tutorials will make up the majority of my videos, I still need tutorial requests that will break up the monotony. So, please leave your request below on topics that you’d like covered. If at all possible please leave requests that can be answered in 1 or 2 videos. 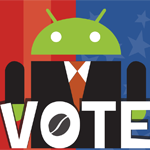 I got goose bumps when I saw all the things we will learn if the vote wins on the Android side. Which it probobly will. People are more interested to creating stuff first before they learn about networking because what is the point if u cant do anything but know networking right? You might be surprised by how many people pick J2EE. I expect votes for that topic to jump very soon. We’ll see what happens? I’m gonna cry because of happiness if you start teaching J2EE…. Please ignore the votes and start teaching…. I understand you better than almost all the other teachers in youtube/college. The vote is for tutorials for games or business applications. I personally like JEE because: first for desktop game creation you fisrt have to learn C for a quality game. Android is good but there are many Android tutorials, but not so much JEE consistent tutorials. And in the past java tutorials you learned how to do stuff, now with JEE you can learn to do much bigger stuff. I promise that if Games/Android wins I won’t make boring games. I’ll cover everything including all of the math required. They will be high level tutorials that will challenge you instead of talking down to you. I feel my community, while small is intelligent enough to be able to grasp high level topics. Most tutorials that others make are aimed at the majority of people and that is why they don’t aim to do big things. I plan on covering C definitely, because Java 2D / 3D is too slow for anything except a platformer. To cover OpenGL everyone will have to have a grasp on pretty high level mathematics and I’ll cover that as well. Another thing that I think that is missing in most game tutorials is a focus on graphics. I’ll cover how to draw as well. All of this will happen if Games and Android wins. In that case Games also is a very good choice, i like a challenge too. Derek i have to say this YOU DA MAN in capital letters on purpose. thx for everything !!! Thank you 🙂 That is very much appreciated! Oooh. Its close, but I’m more in need of someone to explain what the heck is up with Spring and Tomcat. Even if the other one looks more fun. 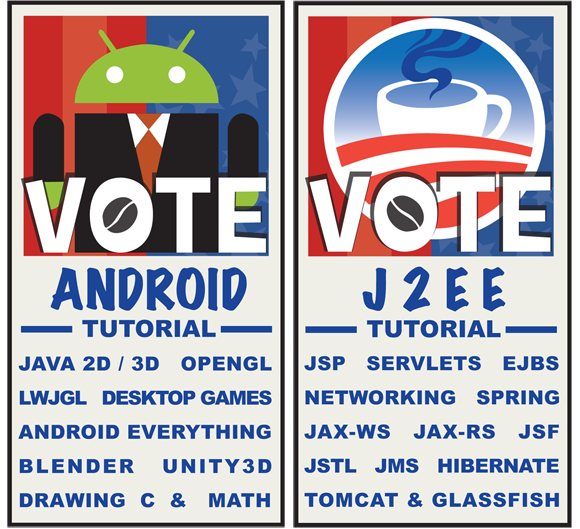 So I’m voting for J2EE. Android won and I have been making those tutorials ever since. Also if the final choice is ‘Android’ and when you show us 3D game programming oyu might as well teach us 3D sound eh? Thank you for all of the wealth of knowledge you have shared with us for “FREE”. You have helped me to understand a lot of the college classes I have been taking and have given me the ability to advance them as well. Looking forward to either of the topics… either way we win if you are teaching them!!! Keep up the good work and if I can help in any way please let me know. How on earth can you know so much about so much topics….. I like to see tuts on PHP OOP design paterns, symfony2, Yii, Zend Framework, jQuery and CSS frameworks. I’ve basically only been programming and drawing for my whole life. I’m not particularly knowledgable about much else. I have already covered Jquery Tutorial and CSS Tutorial. I want to improve them and will when I get into web applications. Derek, your one of the coolest people I know. You help us all and you don’t care for hate. I hardly think there even is hate on your channel but you’re just amazing to share your skills. Do a series on html frontend frameworks such as angularjs, backbone, sass, compass, etc. Latest productivity tools would be nice. More wordpress plugin stuff if you have not already covered everything. Thanks for the best tuts on the web. I can tell how much time, effort and compassion you put into each one. I am also making fun of the Greek government elections because the people that vote for the evil corrupt politicians are the same ones that feel the austerity measures the hardest…but their mindset remains the same nevertheless…..now if that’s not laughable, i don’t know what is. I used to be into politics, but after a while I realized that thinking about it always made me mad. No matter who wins, unless you know somebody in political office you are never heard. What about c++ ? I think that would complement Java very well. How about a tutorial on RESTful services or API’s? Thanks again for your dedication to teaching. That will be covered as part of the J2EE tutorial. Even if J2EE doesn’t win it will be the next tutorial. This is just a vote on which tutorial comes next. This is the best comment from you Derek. If you will be able (I hope will be) to cover the loser candidate later, then it is not necessary for me to vote. Anyway THANK YOU Derek for all these efforts, it is priceless at least for me. I’ll see what I can do. I promise what ever I do I’ll make sure it is done as well as I can. If you go the Android game programming route then it would be cool if you could include some AI programming. I plan to do some game programming in Android once the OUYA console comes out so it would be very cool if that wins. Thanks a bunch for your videos, they have been very helpful. I promise if I do a games / Android tutorial that I will cover everything. I don’t know if anyone is really ready for this type of tutorial though? I’ll cover game design / drawing, all the math needed and everything else I can imagine. It is expected to last for at least 6 and more than likely 8 months. I’ll find out how many people will stick around for the entire ride? When you doing next tutorial can you use NetBeans as IDE? Just found your tutorials. Your voice was made for videos 🙂 Nice quality. Nice pace. I can’t wait to seriously try a few. I’m going to start with Java. I’m particularly interested in JDBC and JavaFX, not so much Swing. Are the “Design Pattern” videos part of the Java series? I see video 92 is Eclipse. Maybe video 93 could be Netbeans? Definitely glad to see the code used in the videos is available. Sometimes it’s difficult to see/follow along in a video, and more importantly you learn and retain way more if you can try it yourself. Perhaps including a link to any particular worthy books would be a nice addition. I’m glad you are giving my videos a chance. My face was sadly not made for video 🙂 I have many of my java video tutorials here. Pretty much everything I’m doing on dsign patterns, refactoring, object oriented design, etc. is a continuation of the java tutorials. I’ve covered databases in depth, but I’m going to cover game and tablet development next over web development which many seem to have covered already. I would love to see some code audit tactics security, portability, performance, and others if there is an audit term that is particularly interesting. Metrics on project completion. support after shipment, community involvement via add-on modifications or within features of the project. Finally how to make high level decisions based on these datasets. Hi, I think we should rather learn C++ than C, I know they are very similar but I think it’s best if you teach us C++ rather than C because pretty much almost all games are made with C++. Hi, To design games let’s aim at making a platformer like Mario before we try to make Call of Duty. Call of Duty was made by hundreds of people with a ton of experience. I have to first teach you how to make more basic games. C works best in my opinion because I want to make Android games and Android uses Java. I’m not going to be done with the game tutorial for some time. It will take me months to teach all of the topics required to make a really great game. Derek, your tutorials are amazing. I’ve seen many of your Java ones and they helped fill gaps in my Java programming better than anything else I’ve done (I’ve been teaching myself Java for the last 5 or so months). I love how they are edited to go through the content efficiently and how you are concise in your explanations. The only issue I had was it was a bit difficult to navigate your site and find the video I was up to! You’re awesome, keep it up! I really want to see what you can do with the Android/Games tutorials. Thank you very much for the kind words. I’m glad the videos are helping you. I combined all of them on one page to make it easier to find the topics you are looking for here Java Video Tutorial. Im routing for J2EE but mainly because of the networking part,however i will enjoy gaming if gaming does eventually win. Hey could you please make C tutorials instead of C++? I think most people want it even though C is faster. C++ is more commonly used. They are similar but people want C++ tutorials. I’ll get into c++ eventually. I’m going to make a Game / Android tutorial because that is what it seems like everyone wants. Because the ultimate focus will be on making Android apps I need to use Java. To increase the speed of a Java app you have to use c. There wouldn’t be any benefit in using c++. I hope that makes sense? So there will be no complex game creating with good engine and advanced math? Derek I think in the future in your tutorials at the end of a tutorial you should give a viewers a challenge. It will make things more fun. Thank you for the request 🙂 I do that on occasion, but it didn’t seem to catch on. At the end of my Interpreter design pattern tutorial I told people to turn it into a text based game, which I thought would be easy. I definitely need to include testing on this site. I’m working to do that soon. Can you please make a tutorial on how to develop a programming language with XText? Looks like I have to 6 months for you to start with J2EE Tuts. In the mean time, is there any verified source where I can learn JAX-RS & JAX-WS. I see them show up in Job Sites and I have clue on how to use it in a J2EE application. I’ll see what I can do. I have no idea what other people do because I don’t watch other tutorials because I don’t want to be influenced. I know the NewBoston is the king of YouTube tutorials. I’m very small in comparison. I have just found your videos on youtube. I have been watching the Design Pattern video playlists and I think either android or J2EE would be awesome. So far all the videos that you have done have been brilliant and I am just happy to have found someone who can explain things like you do. Awesome job! Thank you 🙂 It makes me very happy to be able to help. It looks like Android / Games has won, but I have a couple other high level things to cover before that like refactoring. Fantastic! Thank you for these excellent videos. Your time and effort is very much appreciated! You are an amazing dude! I have nothing but admiration for someone who knows so much and works so hard to share the knowledge. A world filled with people like you can’t be in strife. Your videos are not just informative but they’re so well made! Are you a one man operation or do you have a team?? You’re the man Derek. Really excited to see what you have in store. Will u use any libraries like lwjgl and or slick2d? Thank you 🙂 it is going to be fun and I’ll definitely cover lwjgl and slick2d after I cover OpenGL and how you can use Java with C for speed. It won’t be the normal game tutorial. I’ll cover everything. I hope to recreate classic games over the years that changed everything. It would be fun to cover everything from Zork to Mario, Sim City, Black & White to Minecraft! Greetings, I was wondering if you had any future plans to do any videos going over IIS and ASP.NET? Hey Derek, greetings from a fan. For the (not so distant) future: Node.js for web and device web apps. For now, Adroid games FTW! When I was preparing to start my own small company last year I was forced to think extremely low budget. Fortunately my impulsive plan to save money by building my own website turned out to actually be quite do-able. But only because of your tutorials! I just watched the ones on your site (and those on thenewboston which also contain some very nice ones) and since than I’ve built almost three websites already, and I’m advancing a lot in the process! Well obviously I have googled myself sick to find out if, and how, it might be possible to update manually?? However I couldn’t find a clear comprehensible answer anywhere on the web. It seems there’s this thing called flashing your cellphone, and it might be possible to use that to force your phone to upgrade, but I still have no clue whatsoever as to how that’s done. Could you perhaps make a videotutorial about this subject or point me in the right direction? I’m very happy that my tutorials have helped you 🙂 I however have no idea how to update the Acer Stream. I looked everywhere I could think to look but I didn’t have any luck. Sorry about that. Possible suggestion, maybe to cover using something like PhoneGap to help combine knowledge of Android stuff and the different web development tutorials you made. Absolutely can’t wait for this series to start, you truly have a gift in your teaching abilities. There are a lot of tutorials and books covering android development, but there is very few ones covering the Java EE. We hope so to get a nice tutorial from you for this less covered technology and difficult to catch for a beginner enterprise application developer. You have done a very awesome tutorials on UML, OOP, JAVA, DESIGN PATTERNS , CSS/JS/HTML/XML . So a Java EE tutorial will be the “Put in all together” in an enterprise application project case study. Hi Derek, do we need good background in programming before we start watching tuts for android games? Its sounds too complicated. That really depends. I decided a few months ago that I wanted to teach how to create great software. There is a big difference between software that is professional grade and what is taught in 95% of tutorials that are out there right now. I also decided to cover topics like refactoring and OOD because you guys requested it. I have to say I’m very impressed with your videos so far and have recommended them to many of my friends since. One big thing I want to learn is how to write code for the Java Spring Framework as well as Spring MVC. Google Webtool Kit (GWT) is also on my list. Dependency injection seem to be the hip way of doing things now and I hear it would be making it’s way into PHP v6 . It would be something great to cover if you haven’t done so already. Although you have demonstrated it many times when you programed to interfaces I don’t know if you have ever pointed it out as that yet. It has less capabilities than PHPUnit but for smaller projects it works just fine. It has almost the same API as PHPUnit plus it can also test the UI of a website which I thought was cool. Unit testing would be a nice series to round off all the others you have done so far on the fundamentals of software design. One quick question. Where do you turn to learn all these things about Java? I’ve been trying to find some good resources for this other than reading books! Like most people here I like watching videos. Most video tutorials only cover the basics of the Java language and good videos on Spring and GWT are almost non-existent. I’m looking forward to what you come up with next! Thank you very much for the kind words 🙂 I will definitely cover Spring very soon because it has been requested many times. I also plan on covering unit testing very soon because it applies to what I’m working on right now. Everything I write about comes from books. I’m afraid of watching other video tutorials because I don’t want to be influenced by them. Lately I have been receiving requests from university students to explain complicated books. You guys control what I do here. My proposition on short tutorial is – using Github tutorial or using generally about CVS but personally I would like to watch about Github 🙂 Keep up good work! I like your videos and these are amazing. Could you please set category of these videos as “Education” on YouTube. That would help us accessing YouTube videos with Education filter is ON. I have a couple of ideas for short tutorials – mostly based on my lack of understanding of the topics! First is UI design patterns, like MVP, in Swing. From what I’ve read about those types of patterns they seem like a really good idea, but I can’t find any good tutorials about implementing them. Second is Unit Testing – I’ve done a fair bit of trial and error learning of Unit Testing, but I’m not sure I’m doing it right. It seems like this would be a good fit for your series on design patterns and refactoring. Ask and you shall receive 🙂 Here is my MVC Java Tutorial. It is much easier to understand than most people think. Thanks Derek! You’re one lean, mean, video making machine! PS You’re right – it was much easier to understand than I thought! Great! I’m glad to have been able to help. I love when people ask me for tutorials that are short and relevant to the topics I’m currently working on. Derek, I just wanted to drop in to say Thankyou so much for all these videos. I gave up my accountancy job nearly a year ago to change what was then my hobby of programming into a career. These videos have been invaluable (more so than a course at Dundee university). I cannot even begin to imagine the amount of effort it takes to produce these, but I guess you must enjoy it, for which I am very grateful. I have to say I look forward to your “well, hello internet”, it makes learning fun. Long may you continue to enjoy it so that I may reap the benefits. And look for me snapping at your heels as I become a more proficient programmer because of these series. Neil, thank you for taking the time to tell me how much the tutorials have helped 🙂 The only way we find happiness is if we never give up looking for it. I know that was true for me. you are a great person doing great work, you deserve some kind of award for all your hardwork, Can you please do some tutorials on Investing, stocks, equity and venture capital. please.. Thank you very much for your video tutorials.I learned many this. It is better if you can create a advanced java GUI video tutorial series. Derek, Don’t know how you do it – but your approach, communications and finished product is *** AMAZING ***! Thank you and best to you. HI, may I ask if you plan to make any video tutorial on C++ later ?? I know you busy with andriod tutorials and i think the tuts are great learning a lot of stuff, however i current working on java httpclient im failing to manage user sessions between my server’s client(where httpclient is running) and the remote server’s session management. additional info: the application is built on AngularJS therefore there is less server interaction. All your tutorials are awesome, and makes me more professional in my domain, really I don’t know how to thank you & actually I missed to vote, may be I vote for J2EE its oki now, but will you please share some video tutorials about “Web Service” please. Can you talk a little about using other people’s code (in general), as opposed to starting a new project from scratch? In particular: how do you familiarize yourself with an existing application (or framework) when there is already a humongous code base that you need to gain a solid understanding of before you can do any real sort of work? I believe this could be an interesting topic. Most of the job offers I come across are about maintaining existing code or converting legacy code. Besides, you haven’t posted anything under “Random Videos” in a while. In my opinion there is no such thing a original code. Languages aren’t all that complicated. Yes you spend a ton of time maintaining hopefully well commented code in the corporate world. Seems like the keyword is ‘documentation’. But when the documentation doesn’t exist, I find it very hard to tell what a program does just by looking at the code. All I really know how to do is run the program through the debugger over and over until I understand how it works. Makes me feel like there has to be a better, more organized approach. Nothing in particular. I was just wondering if you have any anecdotes to share that could be at all related. I did get the answer that I was looking for, it’s just not what I was hoping for. Anyway, love your videos. You’re the best. Personally, I can’t wait for the C tutorials! And later on, C++. Been getting my feet wet with CS50x and I am looking forward to Derek’s teaching style applied to the subject. You’ll be happy to know that I will be making C tutorials while I continue the Android tutorials starting near the end of next week. Have you ever thought about doing a combined python and C tutorial? I will definitely cover C++ and I plan on combining C++ with java very soon. I’ll revisit Python at some point in the future, but I’m not sure when. Can you show us how to make a mobile friendly website? Are you still going to do the video for J2EE and if yes, May I know when will you start ? Thanks . Your video has inspired me a lots. Thank you so much. Thank you 🙂 I will cover J2EE eventually, but I want to finish with C first. The Android tutorials will continue for the next few months. All I can say is that J2EE will start when C ends which will be pretty soon. Love your Android Video Tutorials! I found your site while I was trying to find some code to solve a specific problem. I want to be able to show a particular video in an app and I need to be able to know when it is finished automatically. Actually several short videos in the middle of a timing sequence. Have you considered any tutorials using mediaplayer? Do you take on special projects? I plan on covering how to display videos, sounds, pictures, etc. very soon. I’ll get it up as soon as possible. You didn’t say if you take on special projects? What do you mean by special projects? I need to produce an animation that switches back & forth between animated views (extended ImageView with canvas draw) and videos (embedded assets). Have pulled out about as much hair as I can afford. What languages, devices, etc. are you doing this with? I’ll be making Android tutorials until I’ve covered everything. It will take some time. Thank you for offering, but I already have way to much work. great explanation :)I spend so much time in searching for understaning different UML diagrams that are offered in Rational rose and here you explaned in a such an amazing way!!! I m seriously uery thank ful!!! Thank you very much 🙂 I’m happy I could help. May God bless you as well. That will come very soon because I need it for Android. I love your videos, really helped me with patterns. I’m glad to see your channel growing in quality and variety. I’d like to request for vids on SCM, Maven in particular; That sort of stuff seems pretty important but cant fully understand it; I’m below average at GIT and while i’m ok at programming and such, i cant wrap my head around teamwork and SCM. This may not be the place for this comment,but it’s the only way I see to tell you this. This is my first visit your site, which I found from a you-tube video. I just like to express my gratitude and thanks you all the work that I see you have put in here. I have not used any of the tutorials yet! But I intent to I have my eye on one now ;}. I very much appreciate you taking the time to tell me you like my website 🙂 Always feel free to ask questions. I’m here to help if I can. I really like your tutorials. I reallylearnt a lot. It would really help me if you did tutorials on matlab,arduino, microcontrolers, etc.. Thank you 🙂 I have been planning an electronics tutorial for a long time. I can’t wait to do it! however could you shed some light on byte code instrumentation (java)? Thank you 🙂 I’ll see what I can do about BCI. I would love to see something about the new Java 8 features like lambdas and such. I think these could be dealt with in maybe two or three videos. Sorry about the enterprise Java tutorial. I just made a decision to not cover it until I could devote all of my time to doing it right. I’m trying to cover topics I have missed like Git, JUnit and Maven now. I’ll do my best to fit in other things I’ve missed with Java. How about a one or two videos on SASS or LESS css preprocessor tutorial? I added your request to my list. i just adore the way you do your stuff in here and you have given me hope to continue being a programmer. Thanks a lot and God bless you. Please i want you to do tutorials on Django pleasssssss! Hi Derek! Could you do some tutorials on Ruby on Rails ? I’m an active follower of your website. It’s the best and I love your videos. I’m getting a job working with J2EE technologies (glassfish, jsp, ejbs, hibernate etc) and I’m still a bit lost with all these new (for me) stuff. I have a fair knowledge about Java SE but I need to learn more enterprise stuff. All this to ask you: Are you still planning to do the J2EE tutorials? I find all your tutorials really useful! I’m working on the games tutorial right now. I’ll upload it as soon as possible.